Scientists in developed countries provide nearly three times as many peer reviews per paper submitted as researchers in emerging nations, according to the largest ever survey of the practice. The report — which surveyed more than 11,000 researchers worldwide — also finds a growing “reviewer fatigue”, with editors having to invite more reviewers to get each review done. The number rose from 1.9 invitations in 2013 to 2.4 in 2017. The Global State of Peer Review report was undertaken by Publons, a website that helps academics to track their reviews and other contributions to scientific journals. The authors used data from the survey, conducted from May to July 2018, as well as data from Publons, Web of Science Core Collection and Scholar One Manuscripts databases. 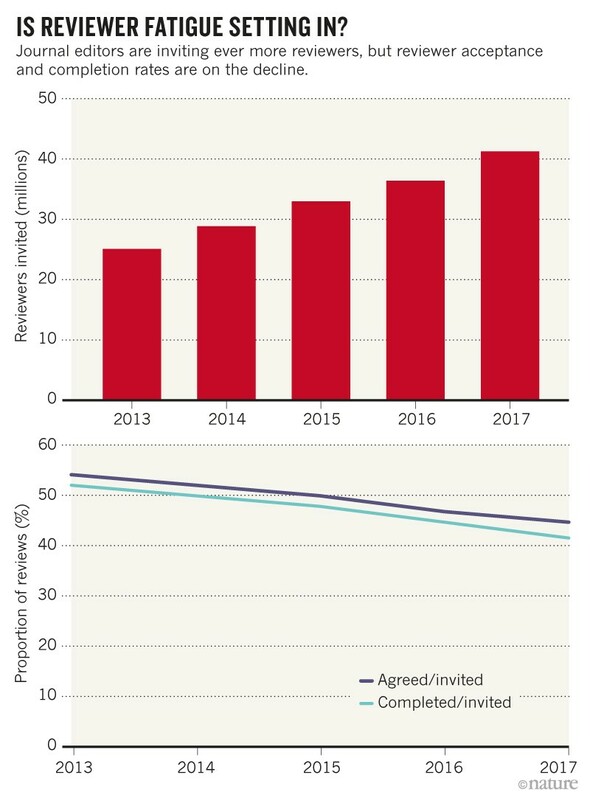 The report notes that finding peer reviewers is becoming harder, even as the overall volume of publications rises globally (see ‘Is reviewer fatigue setting in?’). And although contributions to peer review from emerging economies are lower compared with developed countries, they are rising rapidly, says Andrew Preston, managing director of Publons, in London. “Peer reviews lag publication, so it will take a few years for emerging regions to catch up,” he says. Researchers in leading science locations, such as the United States, the United Kingdom and Japan, write nearly 2 peer reviews per submitted article of their own, compared with about 0.6 peer reviews per submission by those in emerging countries such as China, Brazil, India and Poland, the study found (see ‘Uneven contributions’﻿). Scientists in emerging economies are more likely to accept requests for peer review and complete their reviews faster than those from established economies. But their reviews also tend to be shorter than those from colleagues in wealthy countries. The report says scientists from emerging economies might review less because editors’ networks and scientific are still largely centred in developed nations. In 2013–17, the United States contributed nearly 33% of peer reviews, and published 25.4% of articles worldwide. By contrast, emerging nations did 19% of peer reviews, and published 29% of all articles. 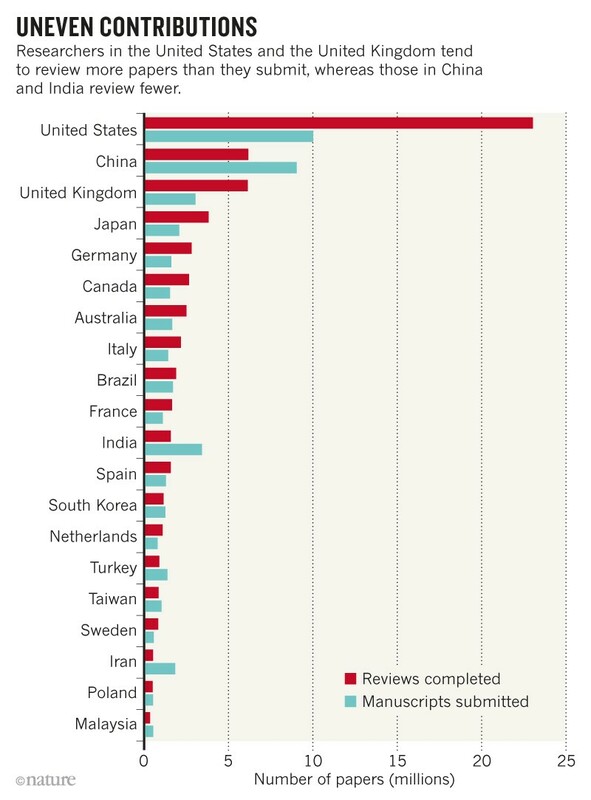 China stood out — the country accounted for 13.8% of scientific articles during the period, but did only 8.8% of reviews. Even so, China overtook the United Kingdom in numbers of peer reviews conducted by its scientists in 2015, the study says. China’s inclusion of could skew the picture, says John Walsh, a sociologist at the Georgia Institute of Technology in Atlanta. The study notes that the number of peer reviews from emerging nations grew by 193% in 2013–17. That’s not surprising, Walsh says, because peer review offers several perks to researchers, including — usually — a few months of free access to the journal and the opportunity to view the latest research before it gets published. The study’s main message, Preston says, is that scientists in emerging nations are keen to do peer review, but do not receive as many requests as their colleagues. This is despite the fact that journals find it increasingly difficult to get their articles peer-reviewed. This chimes with experience on the ground. Mohd Abas Shah, an entomologist at the ICAR Central Potato Research Station in Jalandhar, India, says he has published five articles in international journals, but has received only four peer-review requests throughout his whole career. “Peer review provides opportunity to develop a good reputation among colleagues and possible collaborations,” he says. “Fewer opportunities for peer review means missing out on that." The solution, the study recommends, is for scientists to cast a wider net when looking for potential peer reviewers. But journal editors can also do their part by being more considerate of people’s language skills and by forming alliances with journals in emerging science regions, says Juan Corley, an ecologist at Argentina’s national agricultural-research institute in Buenos Aires, and editor of the International Journal of Pest Management. “We need to increase the number of editors and journal board members from developing economies,” he says. The study found that fewer than 4% of journal editors in its sample came from emerging economies.